Thailand is officially known as the Kingdom of Thailand and previously known as Siam. It is located in Southeast Asia sharing borders with Laos, Cambodia, and Myanmar. The country is divided into 76 provinces collectively accounting for the 198,120 square miles (513,120 sq. km) of the country’s land mass.What are the 7 Wonders of Thailand? The Thi Lo Su Waterfall is recognized as the largest and tallest waterfall in Thailand. It could also easily be argued as the most beautiful as well. It is also spelled as Thee Lor Sue orThe Lor Sue. Thi Lo Su Waterfall, not officially surveyed, measures a height of 820 feet (250 m) and approximately 1,480 feet (450 m) wide. The Mae Klong River is the source of the falls coming down from Huai Klotho and flowing into the Umphang Wildlife Sanctuary. The Grand Palace is a collection of building located in central Bangkok. The palace served as the official residence of the kings of Siam from 1782 through 1925. Today, it is still used for official events. 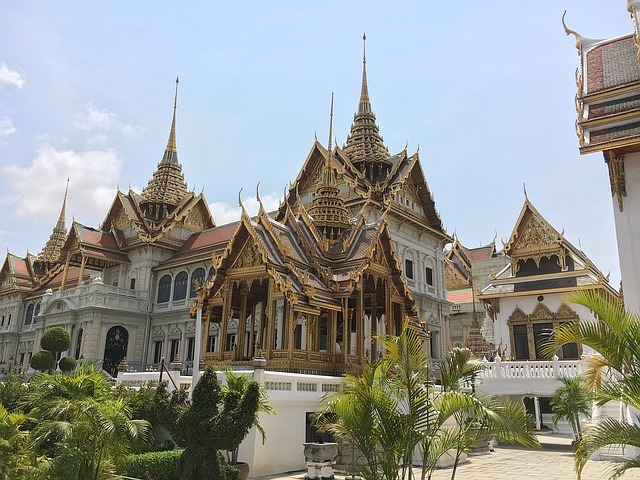 The Grand Palace is one of the most popular attractions both for Bangkok and the country of Thailand. The Temple of the Emerald Buddha is a royal chapel located within the palace complex. The Grand Palace features 12 gates that are dispersed as three on each of the four walls surrounding the complex. There are 17 forts situated along the walls. Wat Arun, more completely named Wat Arun Ratchawararam Ratchawaramahawihan, is a Buddhist temple located in Bangkok. The name translates “Temple of Dawn.” It is one of the leading attractions for Bangkok and the country of Thailand. It is one of the most iconic attractions of the Bangkok cityscape highlighted by the lights during the evening. Wat Arun reaches a center height of 282 feet (86 m) with the corners featuring smaller satellite prang. The base of the prang is decorated with figures of ancient Chinese soldiers and animals. 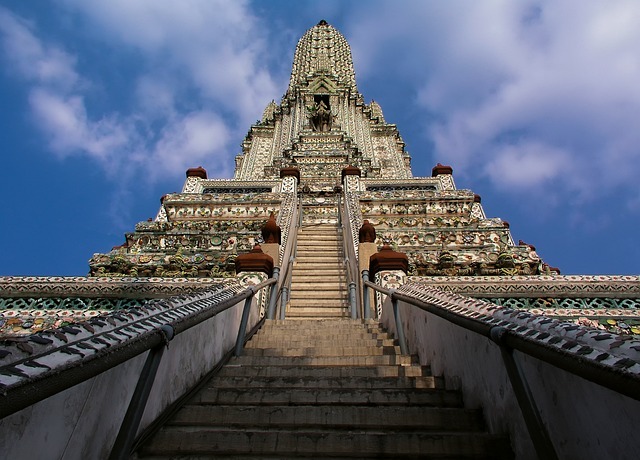 Wat Arun sits along the Chao Phraya River and can be access by ferries from the Maharaj pier. 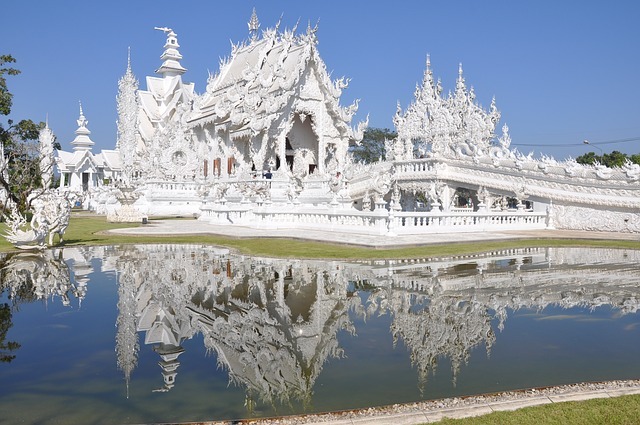 Wat Rong Khun is more affectionately known as the White Temple. It is a Buddhist temple located in the Chiang Rai Province that operates as a privately-owned art exhibit. When completed, the complex will feature 9 buildings that include the existing ubosot, a hall of relics, a meditation hall, an art gallery and living quarters for monks. The Ubosot is the principal building and features an all-white building exterior. The outside features Naga serpents and a three-tiered roof that are beautiful in design. The inside transitions away from the pure white into a more colorful collection of murals depicting orange flames and demon faces, nuclear warfare, terrorist attacks, and oil pumps raging havoc on the world. The main them is that people are wicked.